As you consider a course of action, here’s a check list and some suggestions. Don’t get in a hurry to graze this spring, and perhaps add insult to injury by overpopulating or trampling fields that otherwise have been spared from the damage. Wait until soil conditions allow proper grazing management. This means short, quick grazing passes thus preventing repeated hoof action on wet soils. For those fields that are already damaged, the highest priority now is to wait until soils dry and are fit to work in. As difficult as it is, getting on pugged and compacted soils while they remain wet deepens the damage and further delays the healing of pugged pastures. 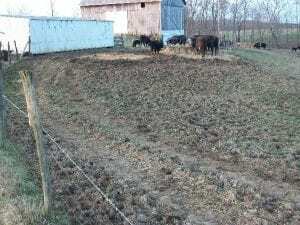 Piles of wasted hay and accumulated manure need to be removed and spread uniformly on the fields that most need the soil nutrients. If soil conditions don’t allow spreading now without compacting soils, it can be stockpiled for spreading later. In lesser-damaged areas, once soil conditions permit, pugged areas might simply be dragged with a harrow and allowed to regrow on their own. If there’s concern for the lack of roots for regeneration of previous forage specie, clover or annual ryegrass might be overseeded in these areas at the time of harrowing. If a total reseeding is being considered, keep in mind spring – especially late spring – is not always the best time for grass seedings. These seedlings can be shallow rooted and can struggle through summer heat due to weed competition, especially if precipitation is lacking. Note, little has been said about fertility. If cattle have been wintered in an area, it’s likely the nutrients from manure and urine that have been trampled into the soil are abundant. At best, it will be a challenge at this time to acquire a representative soil sample for testing anyway. Once early May arrives, if it’s been determined that a total reseeding is the best course of action, early to mid-August will be the best time for this seeding. This frequently leads to a question about how to manage these fields until then, and whether a temporary forage that might be available for grazing once or twice should be planted. The short answer is yes, something should be planted in an effort to shade the weeds and allow some root growth for the benefit of damaged soil structure. However, if it gets late, and the goal is to destroy what you might start in the spring in time to reseed in August, it’s difficult to justify spending much money on seed now for a temporary seeding. Carefully consider the cost versus the realistic potential for plant yield and harvest between the time of planting and early August. If a temporary seeding can be planted by early May, annual ryegrass plus some oats is an option. If it can’t be planted until later in May or even early June, crabgrass is a consideration. I’m often times asked about sorghum-sudangrass or sudangrass. While these are excellent choices for a summer long annual forage that would allow multiple harvests, it’s a challenge to harvest enough forage to recover the costs of seed and nitrogen when the goal is to destroy it August 1 to make a new seeding. If you simply smooth up the damaged area when soil conditions permit and don’t plant anything, weeds like pigweed, barnyard grass, jimson weed, goose grass, and ragweed will fill in until they are destroyed later in the summer. The root action from these plants will be good for the soil, but these plants must be prevented from making seed. Have I mentioned waiting until soil moisture conditions permit before beginning a pasture reclamation project? Even though the ground equipment might not be making a visible track, wet soils below the surface are being compacted to the detriment of any future root growth. 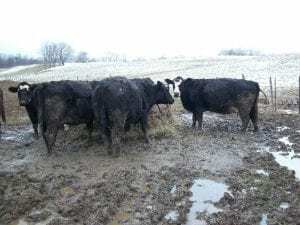 Recovery from the wettest year on record will be neither easy nor rapid on Ohio beef cattle farms in 2019. Be patient and be sure you make the repairs correctly . . . the first time. Posted by Smith at 5:13am April 2, 2019 Posted in Forages, Pasture. Bookmark the permalink.